4.3” Color Fishfinder with CHIRP! A bright 4.3" color display! Garmin's STRIKER Plus 4 is a top choice when space is limited. Rugged, Compact and Waterproof to IPX7 - this unit is smaller in size but not in features. Simple to operate and Install the STRIKER Plus is ready to go right out of the box. Packaged with a dual-beam CHIRP transducer, this unit provides crisp clear detail that you have come to expect from Garmin. Excellent target separation and resolution in both shallow and deep water as well as more visible bottom contours are what you can expect from the STRIKER Plus. And, with the Quickdraw contour software you can create and store up to 2 million acres of custom HD Fishing Maps maps with 1' contours while you fish - no special knowledge or software required! A built-in GPS enables waypoint marking for navigating back and forth to saved points as well as your boat speed. Take a look at the STRIKER Plus 4, great features without breaking the bank! Garmin's 4-Pin Power/Data Cable. 6Ft Cable includes NMEA0183 inputs/outputs. Garmin Tilt/Swivel Mount for STRIKER Plus 4 and 4cv Units. Garmin Protective Cover for STRIKER Plus 4 and 4cv units. Garmin's In-Hull Transducer Mounting Kit is the perfect solution for Kayak Fisherman. Compatible with Garmins's HD-ID (77/200kHz) or GT20-TM(77/200kHz) Transducers (Sold Separately) this in-hull mount allows includes adhesive that attaches and conforms to the inside of the kayaks hull. 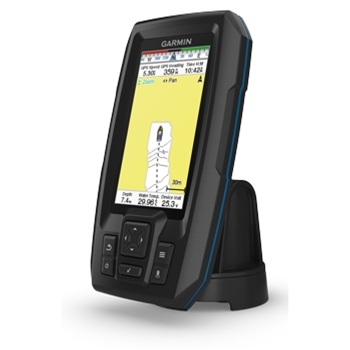 Garmin STRIKER 4 Fishfinder provides sharp sonar images on a crisp 3.5” color display. The included 77/200 kHz transducer offers CHIRP technology enhancing target separation and providing even better clarity. Mark and view waypoints with ease. 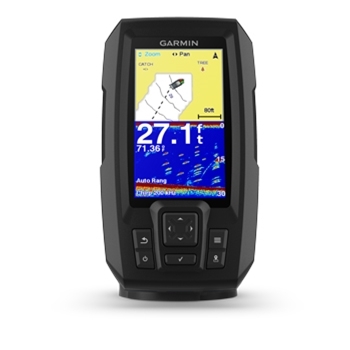 Garmin STRIKER 4 Portable Fishfinder is perfect for a kayak, canoe or even ice fishing. 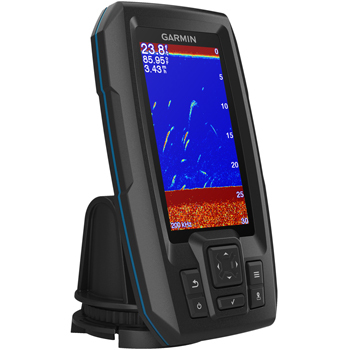 The 3.5” Color Display packed with a 77/200 kHz transducer offers CHIRP Sonar technology enhancing target separation and providing even better clarity. Carrying Case, Rechargeable battery and Transom/Trolling Motor Mounting Kit included.